The premiere luxury destination in beautiful Del Mar, California, is just steps from the Pacific Ocean and beloved Del Mar Beach. Across the street, you’ll find fabulous shopping and dining to your heart’s delight. This exclusive residential community makes for a wonderful travel destination where people are warm, friendly, and inviting. L’Auberge Del Mar, A Destination Hotel, continues to highlight and revel in the excitement of Del Mar’s Bing Crosby fall race meet. This autumn, the resort will feature Spa Specials like the Starting Gate Massage and Run Burgundy Foot Revival. Guests can favor signature M’uleps before and after trips to the Del Mar Thoroughbred Club – a most popular combo of Moscow Mule and Mint Julep. And always L’Auberge Del Mar throws a fantastic party for horse racing aficionados to gather and celebrate. This year’s bash is its Bing Crosby Party on Friday, November 11, a fun tribute to Bing who in 1937 greeted the first fan through the famous Del Mar gates. Friday, November 11, from 5 to 11 p.m. 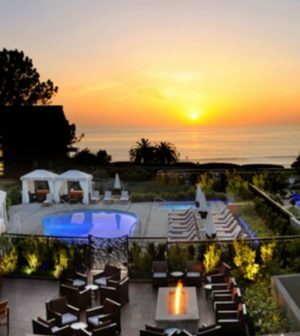 Traditionally this party is the place to be seen and the Del Mar autumn party not to be missed. The Bing Crosby Party is thrown on opening day of the Fall Meet and will celebrate the big day with live Big Band music in The Living Room, the best cocktails in town and, of course, delicious party hors d’oeuvres created by Chef Nathan Lingle. Bars will feature specialty craft beers, fine wines and signature cocktails. It all adds up to another sweet night by the sea. Tickets for the Bing Crosby Party are $65 in advance, $79 at the door, or $295 for “pick six” (six wrist bands); tickets are limited; reserve in advance at www.bingcrosbypartydelmar.com. Private Living Room Vignette is available for $1,900 plus tax and includes: 12 Wrist Bands, Private Space, Custom Charcuterie Board and 2 Bottles of Veuve Clicquot Champagne. Details at www.bingcrosbypartydelmar.com. At Spa L’Auberge, the goal is always to help guests look and feel as beautiful and well cared for as a racing beauty, so three special spa treatments are being offered during the fall racing season. For Spa L’Auberge appointments, call 858-793-6493.